Then we apply our nice thick mascara. That should do the trick without being too overwhelming, right? Perhaps if we spend a whole lot of money, we can get a descent result. There are other options such as getting eyelash extensions or transplants, and even dying eyelashes which is called eyelash tinting. The result? 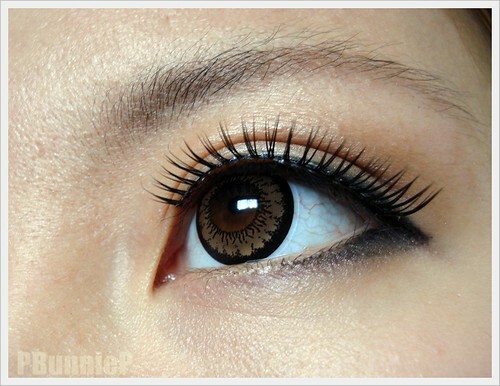 Eyelash extensions can look unnatural, and cost from $100 - $500 USD to have done. Eyelash transplants can cost even more, and you'd have to keep trimming your lashes because they use your hair to transplant in to the follicle, so they keep growing! Eyelash tinting can cause serious chemical burns or allergic reactions, but is more reasonably priced than extensions or transplants but... you could come out looking like the lady above. So, what's the best solution for those of us who want thick lashes, but don't want the risk or expense of procedures? Falsies are easy to apply, and can look natural or dramatic, depending on which you buy. The best kind to start out with are the ones you get for less than $10 at the drug store because the lashes cost enough to be good quality, but don't cost so much you'd be scared to ruin them. Be sure to pick up some eyelash glue while you're at it. Start by holding the lashes up to your eye to measure the length. You'll want them to start a little bit after your natural lashes do if you have dense but short eyelashes, or a little closer to the inside if you have sparse eyelashes. Trim off the excess length from the outer (longer) edge. Some people apply their lashes after their makeup, but I find they end up peeling off when I do this. My tip is to start off by priming your eyelid with liquid foundation or concealer, then applying the lashes. I find the foundation keeps oils from loosening the glue, but doesn't stop the glue from sticking. Some false lashes are on a stiff band, so be sure to wiggle the band a little to make sure it's flexible, or bend it to more closely match the contour of your eye. Apply a thin line of glue to the lashes. You want enough glue that you can see a solid line, but not globs of it. Wait just 15 - 30 seconds for the glue to firm up a tiny bit, then using tweezers, stick the lashes on starting at the outer edge. Try to make sure the corners are stuck down where you want them, then hold in place for at least 30 seconds. Once you have them stuck on, wait a few minutes before going further. Maybe work on your lipstick or hair in the meanwhile to give the glue a chance to really set. With just the lashes on, you may notice you have an obvious line where they end. This is easily fixed with a bit of liquid eyeliner. Just start where the lashes end, and go toward the corner of your eye. If your line is too thick you can lightly wet a cotton swab with either water, or a bit of baby/mineral oil and trace the upper edge of the line until it's as thin as you like. Curl with your eyelash curler, apply a bit of mascara if you like, and that's it! Be sure to do all this after you put your circle lenses in though!! False/Fake eyelashes is not permanent part of our face beauty is the best solution eyelashes transplant restore natural hair and your eyelashes shape as a natural.